The Expat: Jamie Berger, cofounder (with Tom Adams) of Pitt Cue Co., turned a food truck into a brick-and-mortar restaurant that has London dwellers obsessing over pulled pork shoulder and burnt ends mash. This June, Berger’s cookbook, Pitt Cue Co., with a forward by April Bloomfield, will land stateside. 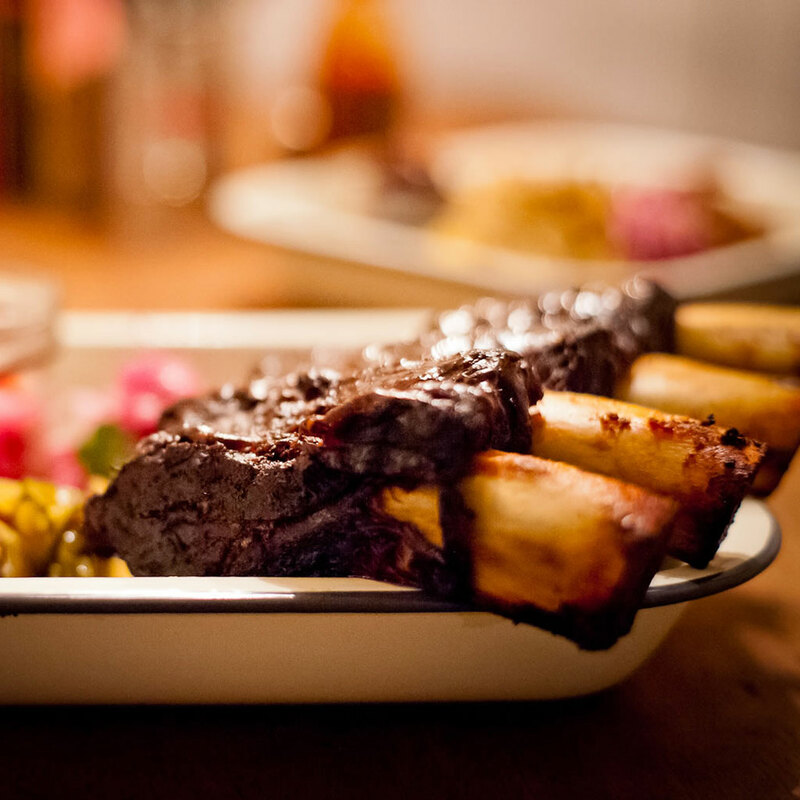 The barbecue emissary, whose family roots are in Texas and Georgia, resides in South London in a converted corner shop. Pitt Cue Co. takes farm-to-table pretty seriously. Tell me about your pigs. We raise Mangalitsa, Hungarian mountain pigs, at Charlie Hart’s farm in Cornwall. Introduced to the UK only recently, they’re remarkable beasts with almost sheep wool–like hair. Due to the high levels of oleic acid in their fat, the meat can be aged to give an incomparable flavor and texture. We receive regular supplies from Cornwall, whole carcasses at a time, and use the entire pig. Zucca on Bermondsey Street for outstanding Italian food and a fabulous range of well-priced, high-end Italian wines. Then two Chinese restaurants: Hunan in Pimlico and A. Wong in Victoria. Both are blessed with friendly staff and creative chefs. At Hunan, you aren’t even given a menu; on arrival, you’re asked about allergies and food preferences, but I’m happy to allow the chefs to send out what they wish. It’s hard to single out favorite dishes but I’m a great fan of their ma po tofu. At A. Wong, the dim sum is sensational. And they can be ordered one-by-one, which is great if you’re eating alone. Where do you go for wine in London? Sager + Wilde on Hackney Road has the most interesting wine list in London and patient, well-informed staff as well as exceedingly moreish toasted cheese sandwiches and charcuterie. Do you have a favorite café? I love walking to French & Grace in Brixton or Italo Delicatessen in Bonnington Square; both are dog friendly, run by people who really care about what they do, and make exceptional coffee. French & Grace serves a range of small plates inspired by Lebanese cuisine; I love their “Über wrap” which is grilled flatbread stuffed with lamb merguez, halloumi and hummus. At Italo, I love the daily-changing pasta dishes. And I’ll wash it down with a mug of beef tea or a Fernet Branca if I’m feeling under the weather. What one food or drink item would you miss the most if/when you leave London? The incredible variety of street food available at places such as Maltby Street Market. You never really know what to expect there, but that’s part of the fun. It’s a crucible for pop-ups and street food traders honing their ideas and refining their concepts without having to fork out for a hefty rent deposit. I’ve had everything from Mexican food to barbecue washed down by locally brewed ales and even a micro-distiller gin.